What first inspired you to take up papercutting? We had just moved house and needed some wall art. There wasn’t much space or money and I wanted to make something myself, so I needed a compact craft that was inexpensive and could be tucked away easily. Papercutting requires very few tools – just a knife, cutting mat, paper and glue – so it fitted into our home and budget perfectly! I found papercutting instantly relaxing and satisfying. You don’t need drawers of supplies (although paper hoarding does become an issue later on!) and as long as you have a stable surface to rest on, you can do it anywhere. In fact, papercutting in the garden on a warm day is wonderful, as long as there’s no breeze! 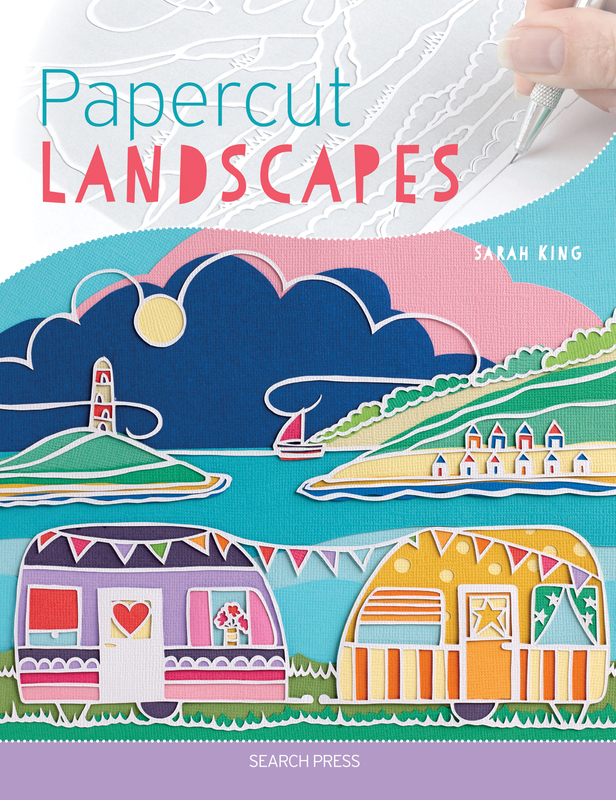 Congratulations on the publication of your book Papercut Landscapes! Tell us where your book writing journey began. Thank you! I’m really excited about the book – it came about so unexpectedly! An editor at Search Press saw my work online and contacted me to see if I was up for the challenge of writing a ‘how to’ book. Of course, I said yes! I had never done anything like this before but I thoroughly enjoyed everything about creating the book. It might sound strange, but I also learnt a lot about my own techniques, because I had to really examine how and why I use the processes I do in order to write about them. Your designs can look so complex – how do you get them down onto paper? Most of my landscapes are imaginary but have elements of things I’ve seen that make me smile – like a colourful caravan, autumnal trees, or bobbing boats in a harbour. My drawing style is naïve and simple which actually suits papercutting very well. Most of my designs begin with one or two sweeping lines across the page to make the coastline. Everything else develops from there. I change my mind quite a lot, so there is a lot of rubbing out before I’m happy! There are also technical aspects to take into account, such as ensuring that every element in the picture is anchored in some way or else bits will fall off when you start cutting. You also have to remember that the design will be cut from the back of the paper which means you have to draw it back-to-front! Generally, l already have an idea of the colours I want to use when I start drawing and these will depend entirely on the season of the landscape or the mood I want to create. Once I’ve finished designing and cutting out the outlines, I gather together all my coloured paper and start to pick shades for each element of the picture, laying the pieces side by side to see how they look together. It’s one of my favourite parts of making the landscape. No matter how hard I try, I almost always default to strong, bright colours because I like joyful, bold pictures. My designs are inspired by memories of a lovely day out or an experience, such as holidays by the sea with my partner and children, or hot air ballooning with my mum. I enjoy the playful Kent coastline where we live, as well as the dramatic cliffs of Cornwall where we sometimes holiday. I don’t think I will ever tire of cosy harbours, rolling waves, Victorian piers and majestic lighthouses on warm, sunny days. I find the refreshing, vast, open space and the movement of the sea both invigorating and relaxing and papercutting that landscape helps to relive those feelings. Yes, I’ve always been crafty, right from when I was a child making junk models or mixing bottles of ‘perfume’ from crushed petals in water – it never worked, by the way! As an adult, I have tried lots of crafts, from cross-stitch to jewellery-making and recently I’ve been reliving my school days by attempting some lino-cutting. I work full-time as an administrator, but once the working day is over, it’s time to take up my position at the craft table with a cup of tea and a couple of scented candles to create a restful atmosphere. I’ll check my social media pages, respond to feedback or post pictures of my latest make. I’ll wrap orders ready for posting, and finally settle down to spending a few hours papercutting. While Apple Seed Paper Cuts is a business, it’s also a diversion from everyday life, a calm place to escape and unwind. What is it about papercutting, over other ways of creating your own artwork, that speaks to you? When I’m papercutting, I lose myself in my work for hours at a time and I find it incredibly relaxing. There’s also the element of surprise because you cut and add colour from the back of the paper, so you don’t know how successful you’ve been until you turn it over! I love choosing the colours for the infills and watching the final artwork come together one piece of paper at a time. Papercutting suits my style of drawing and allows me to create full-colour art that I wouldn’t be able to attempt with a paintbrush! What advice would you give to a complete beginner hoping to take up the craft? 1. Experiment with knives. Most people don’t find their ideal handle and blade combination immediately. This is because people naturally use different pressures when cutting, and also hold knives in different ways. So expect to try different blades until you find one that feels comfortable. Finger knives and swivel knives are just as effective – I now use a swivel knife all the time. 2. Experiment with paper. If you asked a group of papercutters ‘What is the best paper?’ they would each have a different answer. That’s because, like knives and blades, paper choices are personal and also depend on what is being created. In general, paper with a weight of 90 to 160gsm is ideal. Heavier weights are best for papercuts using colour as they are less fragile. I use card with a weight of 210gms for my work. Definitely avoid copy paper, except to practice on, as it creases and curls really easily! 3. Experiment with drawing. Practice drawing your own designs – you will be surprised at how different your drawing looks once cut from paper and that way you’ll be even prouder of your finished artwork! Do you have any exciting plans for 2019? My book is due out on 1st February in the UK and in March elsewhere in the world, so I’m excited to see how people react and discover if they try the designs for themselves. I have a lot of ideas in mind for new original artworks which are going to keep me busy for the first half of the year and I am also talking to several galleries about exhibitions and sales of prints and cards. This year is certainly going to be interesting!